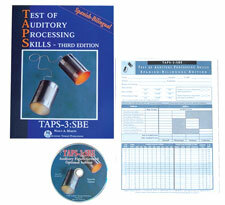 The Spanish-bilingual version of the Test of Auditory Processing Skills, 3rd Edition (TAPS-3:SBE) is a norm-referenced, individually administered assessment of auditory skills commonly used in academic and everyday activities by Spanish speakers aged 5 to 18 years. It provides a way to identify any particular auditory process that the examinee may be having difficulties with, to allow for better remediation strategies to be planned. (It is not intended to assess language proficiency.) While this assessment is administered in Spanish and responses are expected to be in Spanish, the examiner may use English to give directions if necessary, and English responses may be accepted if the meaning is the same as the intended response. This assessment was developed to be used by speech-language pathologists, audiologists, school psychologists and other clinicians who are interested in, and have been trained to assess auditory information. This Spanish version is NOT just a translation, but also includes items that are equivalent to the English version that were developed with the assistance of Spanish-bilingual professionals. The norms are specific to this Spanish version and are not generalizable to the English version. This assessment is untimed, but is generally completed in about one hour (plus five minutes if the optional Auditory Figure-Ground subtest on CD is used) and scored in about 15 minutes. 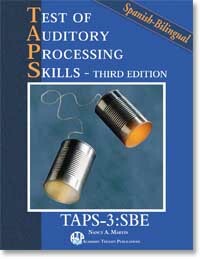 The structure of the TAPS-3:SBE is the same as the English version and represents current views of auditory processing, with tasks progressing from the most basic skills to the most complex. Allowances were made for language and grammar differences. The sentences and passages for the last three subtests were written specifically for the Spanish-bilingual version, with the assistance of Spanish-bilingual school psychology and speech professionals. Like the English version, the subtest and index score structures were confirmed by factor analysis. Optional Auditory Figure-Ground screener presented at the start of the test session. NOTE: Examinees with suspected hearing loss or central processing deficits should be referred for audiological testing prior to assessment with the TAPS-3:SBE, since peripheral hearing problems will interfere with performance of the tasks presented. Likewise, known or suspected attention problems should be assessed prior to assessment with the TAPS-3:SBE, since attention deficits will also interfere with TAPS-3:SBE tasks.